Destin — Front Beach Rd. & Back Beach Rd. Kick off your visit on the 31st (Sat): don't miss a visit to Lombard Street and then snap pictures at Golden Gate Bridge. Get ready for a full day of sightseeing on the next day: take a memorable ride with Cable Cars, take in the waterfront at Fisherman's Wharf, and then head off the coast to Alcatraz Island. 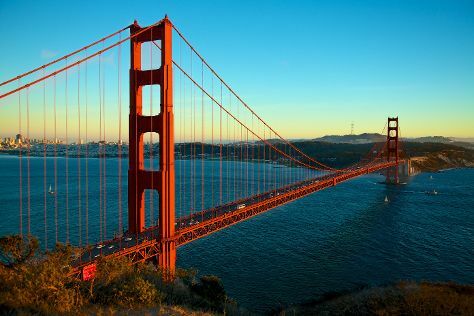 To find traveler tips, where to stay, other places to visit, and other tourist information, go to the San Francisco attractions planner . Manchester, UK to San Francisco is an approximately 14-hour flight. You can also do a combination of flight and subway; or do a combination of train, flight, and subway. Traveling from Manchester to San Francisco, you'll gain 8 hours due to the time zone difference. Plan for somewhat warmer temperatures traveling from Manchester in August, with highs in San Francisco at 26°C and lows at 17°C. Finish your sightseeing early on the 2nd (Mon) to allow enough time to travel to New Orleans. Start off your visit on the 3rd (Tue): take a stroll through Royal Street, then learn about all things military at The National WWII Museum, and then get to know the fascinating history of Garden District. Get ready for a full day of sightseeing on the next day: explore the different monuments and memorials at Lafayette Cemetery No.1, then tour the pleasant surroundings at New Orleans City Park, and then get to know the fascinating history of French Quarter. To see ratings, where to stay, maps, and tourist information, go to the New Orleans online trip planner . Traveling by flight from San Francisco to New Orleans takes 6.5 hours. Alternatively, you can do a combination of subway and flight; or drive. Traveling from San Francisco to New Orleans, you'll lose 2 hours due to the time zone difference. 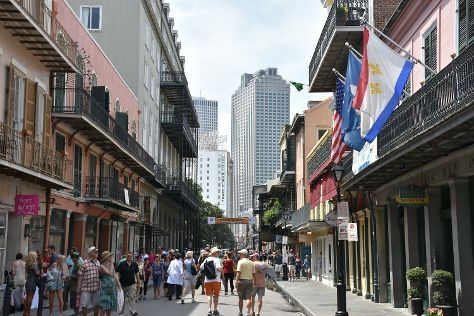 While traveling from San Francisco, expect a bit warmer days and much hotter nights in New Orleans, ranging from highs of 33°C to lows of 33°C. Wrap up your sightseeing on the 4th (Wed) to allow time to drive to Destin. Start off your visit on the 5th (Thu): look for gifts at Sexton's Seafood Market, then fly like a bird with a parasailing or paragliding tour, then make a trip to Destin Harbor Boardwalk, and finally get up close to creatures of the deep with a dolphin and whale watching tour. To see other places to visit, ratings, reviews, and other tourist information, you can read our Destin route builder app . You can drive from New Orleans to Destin in 4.5 hours. Alternatively, you can do a combination of flight and taxi; or take a bus. Traveling from New Orleans in September, you can expect nighttime temperatures to be little chillier in Destin, with lows of 28°C. Finish your sightseeing early on the 5th (Thu) to allow enough time to drive to Panama City Beach. On the 6th (Fri), get up close to creatures of the deep with a dolphin and whale watching tour, browse the different shops at Pier Park, and then cool off at Panama City Beach. Get ready for a full day of sightseeing on the next day: meet the residents at Gulf World Marine Park, learn about winemaking at Panama City Beach Winery, then tour the pleasant surroundings at St. Andrews State Park, and finally look for gifts at Little Village. Find out how to plan Panama City Beach trip without stress by asking Inspirock to help create an itinerary. You can drive from Destin to Panama City Beach in 1.5 hours. Another option is to do a combination of taxi and bus. Traveling from Destin to Panama City Beach, you'll lose 1 hour due to the time zone difference. Traveling from Destin in September, you can expect nighttime temperatures to be slightly colder in Panama City Beach, with lows of 24°C. Wrap up your sightseeing on the 7th (Sat) to allow time to drive to St. Augustine. SAINT AUGUSTINE | PONTE VEDRA on Florida's Historic Coast The Nation's oldest city (est. On the 8th (Sun), brush up on your knowledge of spirits at St. Augustine Distillery, then kick back and relax at St. Augustine Beach, then visit a coastal fixture at St. Augustine Lighthouse & Maritime Museum, and finally look for gifts at Faux Paws. Keep things going the next day: don't miss a visit to St. George Street, identify plant and animal life at St. Augustine Alligator Farm Zoological Park, and then admire all the interesting features of Flagler College. Inspirock's itinerary builder makes planning a St. Augustine trip simple and quick. Drive from Panama City Beach to St. Augustine in 5.5 hours. Alternatively, you can do a combination of taxi, flight, and bus; or do a combination of car, flight, and bus. September in St. Augustine sees daily highs of 34°C and lows of 26°C at night. Finish your sightseeing early on the 9th (Mon) to allow enough time to drive to Marco Island. Marco Island is a city in Collier County, Florida, United States, located on an island by the same name in the Gulf of Mexico off the coast of Southwest Florida. Kick off your visit on the 10th (Tue): view the masterpieces at Malenda Trick Art Gallery, then take a memorable tour with Tours, then don't miss a visit to Marco Island Center for the Arts, and finally zoom along the surf with a waterskiing or jet-skiing adventure. For where to stay and other tourist information, use the Marco Island day trip planning app . Drive from St. Augustine to Marco Island in 6 hours. Alternatively, you can do a combination of car, flight, bus, and taxi; or do a combination of bus, flight, and taxi. In September, plan for daily highs up to 37°C, and evening lows to 27°C. Finish your sightseeing early on the 10th (Tue) so you can ride a ferry to Key West. Eschew the tourist crowds and head to Dry Tortugas National Park and Fort Zachary Taylor. Next up on the itinerary: get a new perspective on things with Boat Tours & Water Sports, learn about all things military at U.S. Coast Guard Cutter Ingham Maritime Museum, identify plant and animal life at Wildlife Areas, and relax and rejuvenate at some of the top local wellness centers. For photos, reviews, maps, and tourist information, use the Key West online trip maker . Getting from Marco Island to Key West by ferry takes about 2.5 hours. Other options: drive. Expect a bit warmer evenings in Key West when traveling from Marco Island in September, with lows around 31°C. Finish your sightseeing early on the 13th (Fri) to allow enough time to take a bus to Marathon. Start off your visit on the 14th (Sat): stroll through Bahia Honda State Park, then take in the views from Old Seven Mile Bridge, then take in the views from Seven Mile Bridge, and finally look for all kinds of wild species at The Turtle Hospital. To find traveler tips, maps, photos, and more tourist information, you can read our Marathon trip itinerary maker . Take a bus from Key West to Marathon in 1.5 hours. Alternatively, you can drive. In September, daytime highs in Marathon are 38°C, while nighttime lows are 30°C. Wrap up your sightseeing on the 14th (Sat) to allow time to travel back home.